One of the best ways of having vigorous seedlings is to use a seedlings tray. 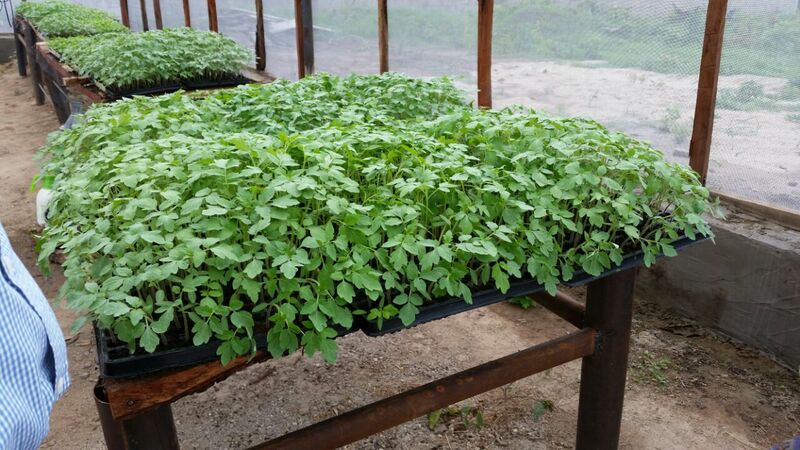 With seedlings trays, you can monitor your germination rate, your seedlings performances at a glance. It would enable you to maximize the use of space as you require small space for quite a number of seedlings and also prevent seeds waste. You can either buy a planting medium or make your own. A planting medium should be made up of sterilized sandy loamy soil, manure, coco coir dust/peat moss. Remember that even in direct seed bed nursery, it is good to use sterilized soil if you can prepare one by first heating (till the soil is around 80oC) your soil in a container for around 30 minutes. Preferably, do it a day before you need the soil to allow for proper cooling. Fill your seedling tray holes with your planting medium and start planting your seeds LINK one by one. 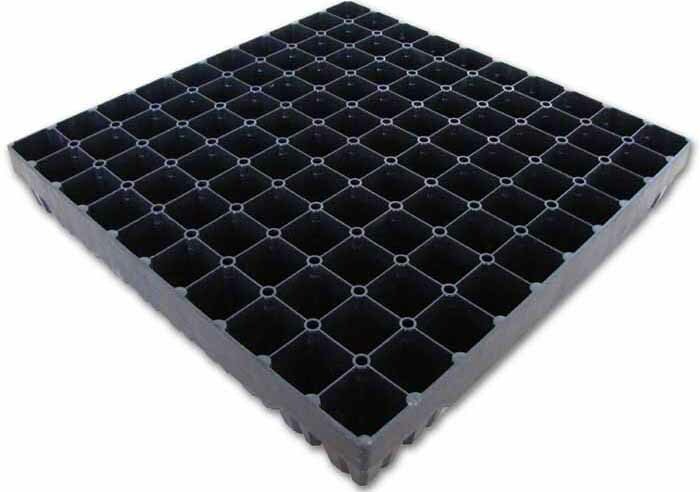 Make sure you move your seeded trays away from direct sunlight and put them inside a net house. Alternative to nursery trays if not available or you want to be cost effective, is to buy something like disposable cup in bulk at average price of less than N3.00 (0.01 US cent). Make small holes under and by their sides, fill them with your planting medium; you are good to go. They are also re-usable if properly handle except that they cover more space unlike the seedling trays. For direct seed bed method, you can speed up germination if humidity is high and temperature is low; a condition often experience during wet season which reduces soil temperature thereby slowing down germination. 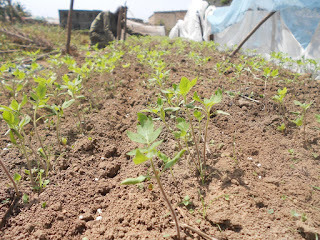 This is done by the use of opaque black polythene which is spread on the seed beds as shown. 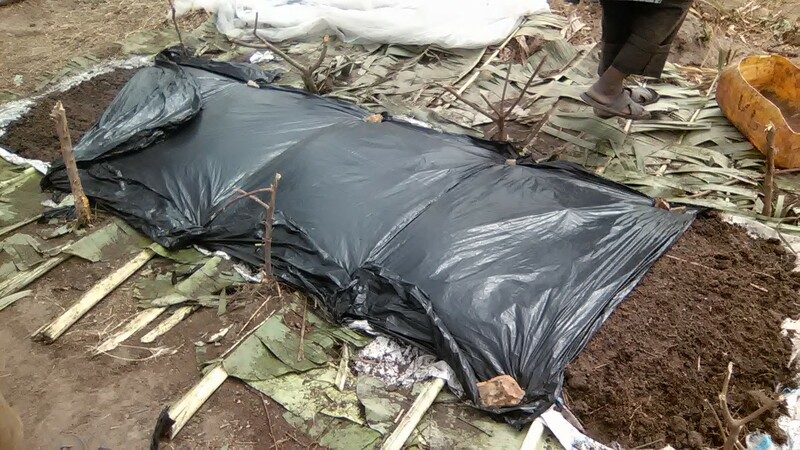 The polythene should be held down at all it sides so as to maintain same soil temperature underneath it. This creates an evenly increased in average soil temperature which speed up germination time. However, the polythene most be immediately removed once germination begins, if not it would kill all the germinating seedlings. Weeding: In direct seed bed planting method as explained in part one, there would always be competition with weeds especially in an un-sterilized soil. So, try to be on top of the situation by weeding once in a week even if the weeds are tiny. Weeds, aside from being competitors of soil nutrients with the seedlings, they may also play host to disease causing agents. However, in nursery tray planting method, you would not always have problem with weeds unless your planting medium is faulty. Wetting: Wetting of your nursery is done once a day manually for seed trays planting method. For the direct bed planting method, your nursery should be wet either by the rain water or manually (if rain hasn’t falling for 2-3 days). If you decide to cover your nursery with polythene during the night or before rainfall as explained in part 1, then manual wetting is necessary. Remember that this is wet season where humidity is high, always make sure your nursery is wet enough but not water soaked. Water soaked nursery would surely result into damping off disease and loss of many precious seedlings. Please, also avoid heavy wetting such as the one that can be witness from heavy rainfall. This makes the seedlings to fall off. A good seedling gives a good yield every other things being equal. However, unattended seedlings would surely produce poor yield. I would teach you some of the combinations of application protocol used. Organic Manure: In preparing your seed beds or nursery trays, it is expected that you already added dried old organic manure in small measure. 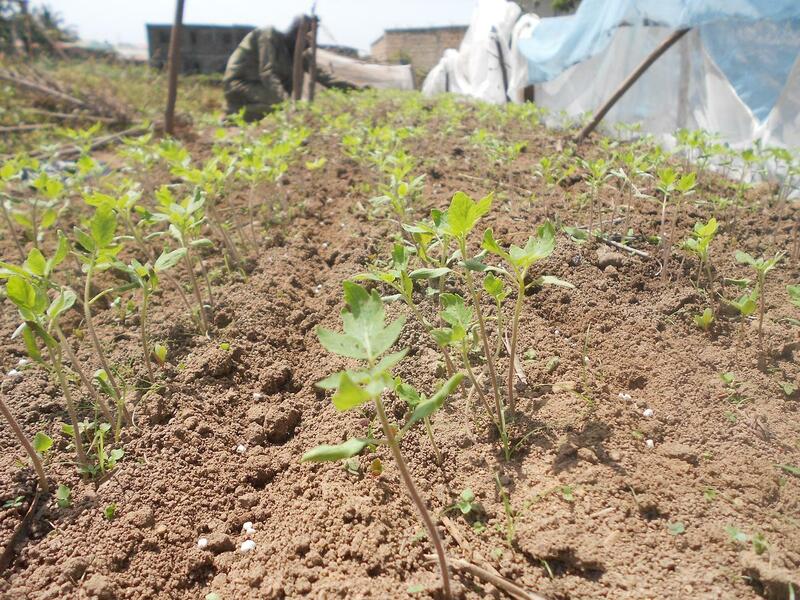 As for direct seed bed sowing method, when your seedlings are 2 weeks old, you can add manure in form of paste in furrows in-between the seedlings rows. Do you now see one of the benefits of planting on rows? The paste form of the manure makes the liquid part of it to be easily absorbed into the soil and enhances it immediate effectiveness. If you can bury it slightly without affecting the seedlings positions, it is even better. 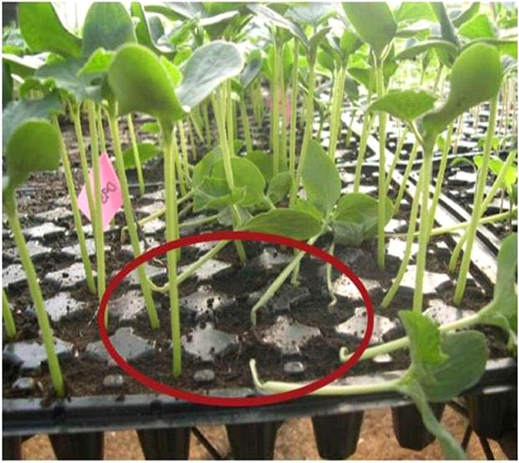 NPK: If you want faster response of the seedlings to nutrients, then use NPK (15:15:15). You arrange its granules along the furrows in-between the seedlings row as shown in the picture then slightly bury them thereafter. Make sure they are of small quantity as shown and that no NPK granules make direct contact with the seedlings as this would result into seedlings death. Folia Fertilizer: Folia fertilizer which is apply by spraying the crop leaves contains a host of micro nutrients which are not readily available in the soil for plant uptake. These nutrients can be absorbed through the leaves and would greatly boost crop seedlings growth rate and healthiness particularly their resistance to diseases. Spray at least once when the seedlings are one and a half week old. Adjuvant and a Surfactant product: If you can find one, mix it with the folia fertilizer in the spraying tank before application. On one hand, an adjuvant is an agent designed to aid in substances’ action. On the other hand, surfactants are wetting agents. It may seem contradictory, but water does not always “wet” plants and their roots very well. Thus, often it tends to bead up on the waxy surfaces of crop leaves and roots, and before water even has a chance to penetrate, it runs off or evaporates. This surfactant/adjuvant helps make water “wetter” by reducing its surface tension in addition to acting as a wetting agent. It tends to increase the rate at which water penetrates common soils. Surfactant also acts as an emulsifier to disperse oils, as a wetting agent to lower surface tension and as a dispersing agent to reduce adhesion between particles of chemicals, so they will spread and remain in solution longer. In summary, it aids the effectiveness of other agrochemicals. Agro-chemicals are supposed to have enough of these adjuvant and surfactant refer to as sticker, wetter and spreader but many of these agrochemicals often compromised on the required percentage inclusion of these since they are not usually declared on the label. Now that your seedlings have germinated, remember you do not leave all the shade over it forever. 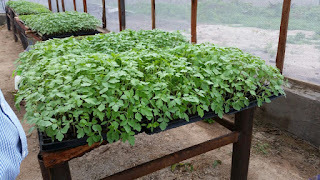 By that I meant that once the seedlings are one week old for tomatoes, two weeks old for pepper, lettuces, cabbage etc., you start removing the shade gradually for sunlight to directly penetrate to the seedlings. Failure to do this would produce very tall yet thin seedlings. I can assure you that with this you have lost substantial part of the yield potential. Finally, 3 to 4 days to transplanting, you then remove all the shades in order to acclimatize the seedlings to the condition expected to be experienced on the field. In addition, you stop wetting or carry out any fertilization. Doing this would greatly reduce transplanting sock when they are eventually transplanted. If your vegetable seedlings are properly taken care of, by certain period, they should be ready for transplanting. Find bellow the table that gives average transplanting period for some notable vegetable crops. NUMBER OF DAYS TO TRANPL. Before starting the transplanting process, first water soaked the field to be transplanted on during the dry season but during the wet season, you might not need that. Make the holes to be transplanted into according to the pre-determined distance before transplanting begins. When you have done all these possibly early in the day, then you can now begins transplanting by late afternoon when the sun intensity has great reduced. However, transplanting can be done any time of the day during a cloudy day possibly after a heavy rainfall during wet season. 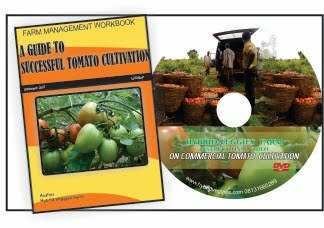 For direct seed bed method, you carry each tomato seedling with the ball of soil around its root using hand trowel in such a way that it may not feel the sock of transplanting. Always make sure you don’t carry much seedlings at a time so that you don’t exposed them to too much of stress. As for the seed trays or disposable cup methods, remove the seedlings with the ball of soil around the root and placed immediately in the holes already dug. 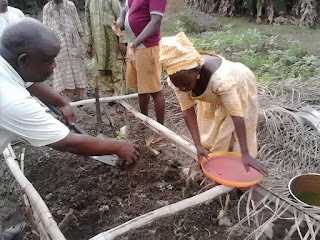 After placing the seedlings into the dug hole, pressed the ball of soil around its base so as to establish good soil contact with the root and force out air. It is good if you also wet slightly if it has not rained shortly before transplanting. To boost the seedling growth rate, you make sure you prepared the field adequately through ploughing , harrowing and ridging (if necessary) in order to soften the soil enough for plant root penetration. In addition, you can also carry out some other things like basal application of inorganic fertilizer, organic fertilizer application and soil amendment measure. Expect an article soon on soil preparation for either direct planting or transplanting. Now that you know all these technique on nursery establishment, do not think you are the boss yet as there are many other things you would do during post-transplanting stage to ensure good yield and earn your cash. 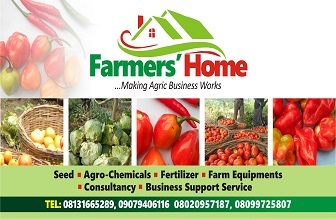 I would also write an article soon on post-transplanting measures to ensure bumper harvest. Thank you for reading. If you have found this article helpful, encourage us by leaving a comment behind to encourage others. Questions and criticism are equally welcome. Thank you.